So this is probably the strangest book review I have done so far. I'll admit a couple things right here and now... if I saw this book at a bookseller or on my Amazon recommendation list, I would have passed it up. Pink predominantly on the cover, Big Bowl of Love as a title, and the pesky Oprah Winfrey endorsement sticker and blurb on the front. Everything screams chick-lit cookbook. Everything screams (to me) run away, run far far away. Oh yes, I just judged a book on it's cover. Tsk tsk. How stupid am I? But more on that in a second. Because I know that Todd and Diane do good work. They are good, kind people, who put their heart, soul, and humor into everything they do. And so no matter what I thought of a cover (stupid me) it had to be good. 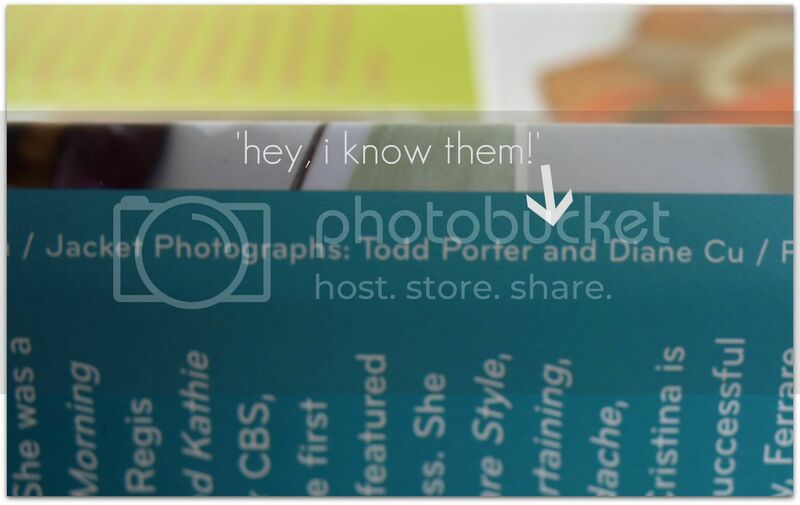 Also, it gave me a thrill to see Todd and Diane's name in print. I don't personally know many anyone who has put something out in print. I adore books and the printed word so anything people I consider friends and mentors have their name associated with a book, I'm so happy. That's a huge accomplishment. Next time I see them, I will be asking them to sign my copy. All fan girl like. Now let's do a cookbook review. Plus the recipe I made last night. Preheat oven to 400 degrees. Place sausages on a baking tray and bake for 30-40 minutes, turning a few times to ensure even cooking. Remove sausages from the oven and let rest for 10 minutes before cutting them into 1 1/2 inch pieces. Cut stems off broccoli rabe, along with any discolored leaves. Bring the four cups of water to a boil, add the broccoli rabe and cover. Boil until tender. Drain in a colander, rinse in cool water, and leave to continue to drain for 5 minutes. Use the back of a wooden spoon to press more water out. Heat a heavy skillet on high heat. Add the olive oil and the garlic, and saute just until the garlic turns golden. Immediately add the broccoli rabe, and mix well. Add the salt and mix again. Remove from heat and set aside. Cook the pasta according to the package directions. Drain the pasta and place it back into the pot you boiled it in. Turn the heat to medium high, add the broccoli rabe, cut up sausages, and red pepper flakes, and mix well. Add more kosher salt and red pepper flakes if you like. Mix in lemon juice and garnish with a slice of lemon. Serve immediately. 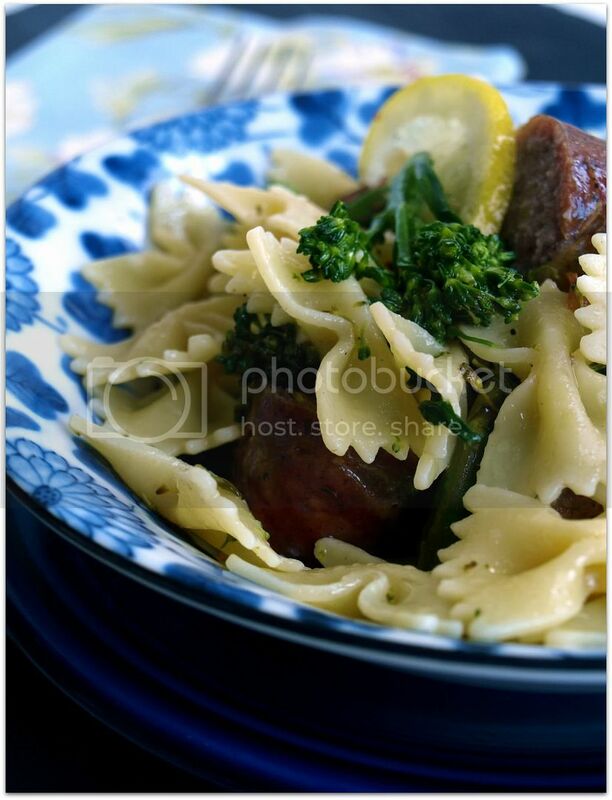 I couldn't find orecchiette (little ears) at my favorite Italian deli/store when I went to pick up the Italian sausage, I didn't feel like running to 5 different grocery stores to find pasta so this is why you are seeing farfalle in this dish. The orecchiette would be a much better shape for this, find it if you can. I added a little salt and lemon to the 4 cups of water that I cooked the broccoli rabe in. When adding the lemon juice to the pasta mixture, I also added zest from 1/2 of the lemon. 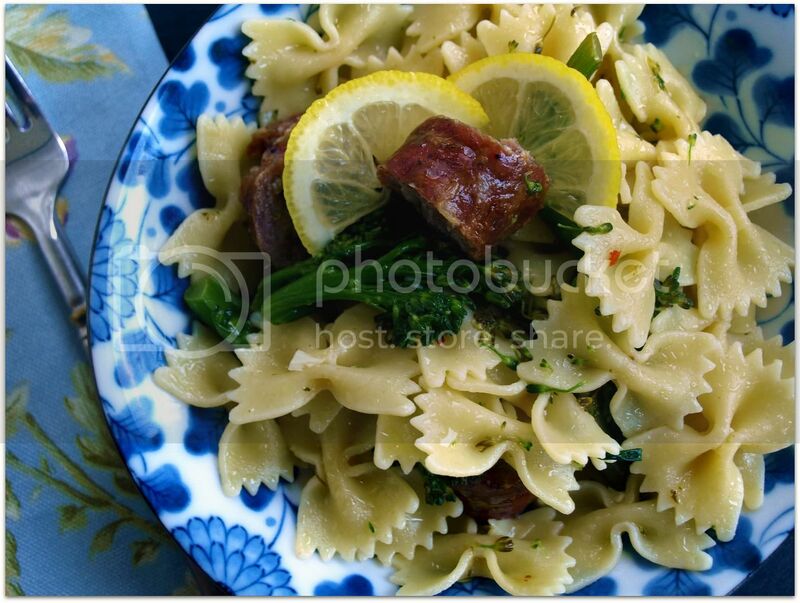 Eat the thinly sliced lemon with the a little bit of pasta, rabe, and sausage all together. Flavor explosion. If you have been reading me for any bit of time, you know dishes that mix bitter, spicy, sweet, acidity all together are my favorite kind of meals. This meal will go on heavy rotation here at evil chef mom, it was that good. Also: lesson learned. I WILL NOT JUDGE A BOOK BY IT'S COVER EVER AGAIN. Still with me? Want to win a copy of this book. Leave a comment. Become a fan of evil chef mom on facebook (that will get you two entries automatically). You can leave as many comments you want. Tell me about a book you wrongly judged. Leave me a funny comment. Leave a comment telling me about how dumb I am for judging a book by it's cover. Say whatever. Winner will be chosen by the Random Number Generator and announced on Monday April 18th. How much bear would Bear Grylls grill if Bear Grylls could grill bear? PLUS that meal just looked oh so good AND I'm kind of obsessed with cookbooks...so here's my comment :) I'm already a fan on facebook and twitter, but for good measure I'm gonna retweet/tweet about this post and talk you up so maybe that will get me a little more clout :) So there you go...I've lost all my self-respect for this cookbook...sigh. She's got hymns!!! She knows how to sing them!!! This dish looks delicious. I just added your blog to my google reader and I'm excited because all of your recipes look fantastic!!! I might have to go to the store and make this right away. 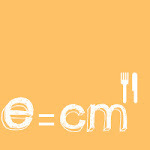 This is one of my meals too. Perfect for spring when all the rabe is comming on. You copped to being all judgey, judgey so you still have the cred. That would be "favorite meals"
*totally* would have been your partner in the judgey-judgey. 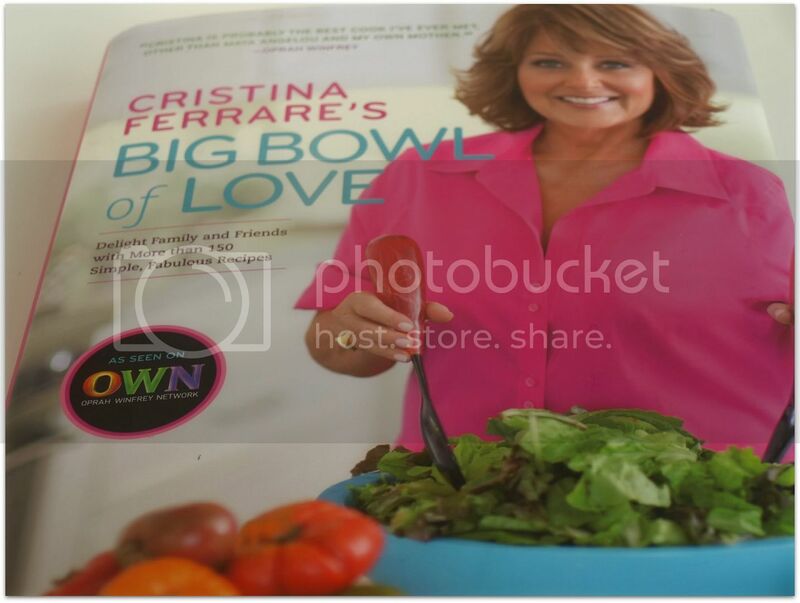 Well let me tell you this first....I actually bought Cristina first cookbook, ummm, let me clarify that, I bought it for my Mom. Cristina had a show on ages ago, in fact I think she was on with Chuck Wolery, anyhoo, she cooked on the show and my Mom always oohed and ahhhed so I got it for her. She still uses that cookbook to this date. So if I won it, I would probably give it to my Mom, AFTER I went through it and copied everything I wanted out of it, lol. I watch her on BBOL and I like her. I'm so happy for Tood & Diane. I was all "I KNOW THEM!" too! You know I'm a follower, and I totally understand the pink thing. You're certainly not alone in judging a cookbook (or regular book!) by its cover. You would think that publishers know now what people look for in their cookbooks - sleek text, simple images, beautiful food, and not a lot of "people" pictures. Of course what matters most are the recipes, so thankfully the cover doesn't matter! This cookbook looks amazing - I would LOVE to have a copy! Alright, I've been a total creepella on your blog for awhile...but that goofy lady with a loud shirt is enough to make me write a comment. It makes me want to vomit. My husband made it...and I had a salad for dinner. Thanks for the giveaway! No matter how much i hate broccoli rabe, this recipe looks absolutely delicious! I miss pasta. No one in my house eats pasta except me (the gluten-free stuff the MiL gets is totally not the same, I do not care what anyone says--rice flour pasta doesn't come close to real pasta) and I never make it just for myself. Maybe Cubby will make his mother happy and eat it so the two of us can have pasta binges while the other two eat salad or something. Guilty here, too. It can be tricky to navigate covers. A reminder to look beyond them! A girl can never have too many cookbooks! I saw Tony Danza on a talk show a few years ago when he was releasing his new cookbook called Don't Fill Up on the Antepasta. What a catchy name. You talked about a pink cover, well, this book is red, entirely red. I didn't expect much, but Wow!! I was pleasantly suprised. Great recipes, great family stories, and readily available ingredients. And, the best meatball recipe ever. I'm Italian my edorsement carries weight in my circle of friends and family. Happy cooking! As for not judging a cookbook by it's cover? The Hooters Cookbook...I know, I know, but everything I've made out of it is wonderful. Same with the Twinkies cookbook LOL! I'm new here to your blog-love it! I added you on facebook also! I actually LOVE that you were brutally honest in this review!! It's so rare to see on blogs!! I LOVE your header btw!! Also, was reading up on how you came up with the name for this blog...(and that entire about me page...Just read it and was cracking up!! haha..you have a great sense of humor!! Thanks for cheering me up today!! Yes Lisa,that was the Home Show!! I liked it on most days..it was way more fun when she co-hosted with Mike Berger! I judge books by their covers all the time. That's why they have covers. People spend ridiculous amounts of money to make the covers look like what they do because that's the image they want to portray. There are billions of books out there, how else would you decide which to get? I don't think I would have picked that book either but your dinner looks delicious. Judging a book by its cover is classic. If there's a person on there, I ask myself whether or not I'd like to have a beer with them. Reading a cookbook is like hanging out with the author, so I'd better be liking that author in order to hang out together. But, if a friend recommends a book, I'll grumble while setting aside and dive in. I probably would have also passed it by... (in fact, I think I did!) but my cookbook collection is getting a little low, and I need to amp it back up again! (and for gluten-free pasta, bionaturae has some great stuff, although the Trader Joe's is good too). Also, Udi has good gluten-free bread. I would have passed that cookbook by too--- so don't feel bad... but once you started reading the recipes. - I am still drooling! Just made the recipe the other night! 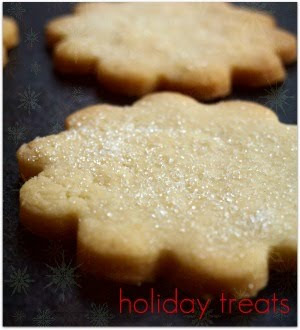 Thank you for sharing this gem of a recipe...so good! I did a short little blog on it. http://bit.ly/g5jq4C Thanks again, Krysta, the wife and I loved it!